GRAHAM Environmental Services has announced a three year sponsorship package for one of the top events in Scottish junior golf. We are proud to be backing Perth and Kinross County Golf’s “Race to The Castle” summer series. 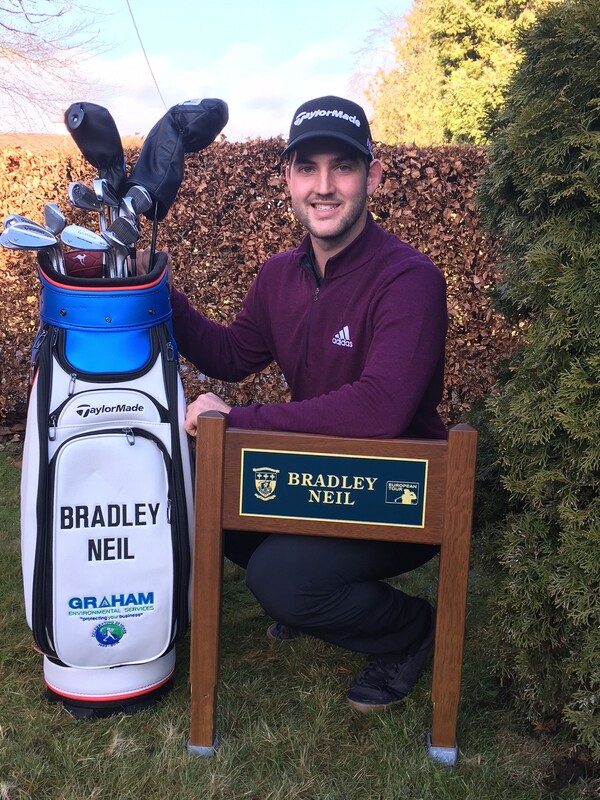 And once again we are supporting Perthshire golfer Bradley Neil, with the company name emblazoned on his Challenge Tour bag. Director Stuart Graham said: “We are delighted to be associated with this popular series, which encourages young golfing talent across Perth and Kinross. “We are delighted to welcome Graham Environmental Services as our sponsor for the next three years,” he said. 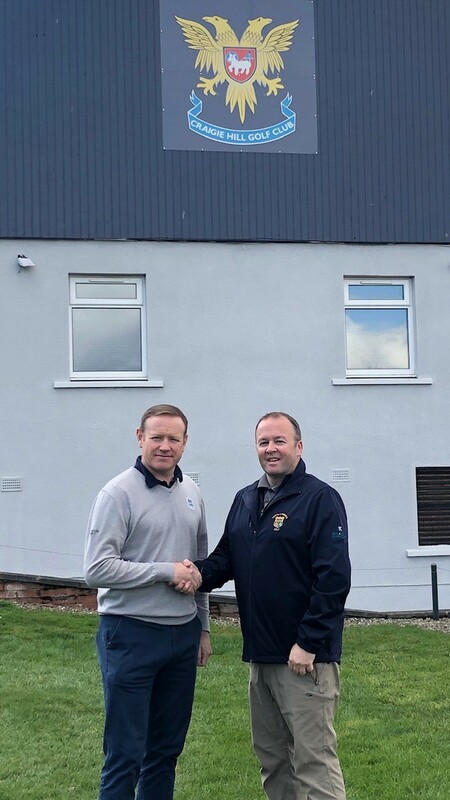 Alan Cargill (right), secretary of Perth and Kinross County Golf, welcomes a three year sponsorship deal from Graham Environmental Services for the “Race to The Castle” series. He is pictured with company director Stuart Graham. Our job team recently carried out a bird proofing job in Angus to prevent bird, mainly pigeons, nesting under the customers solar panels. The attached is an extract from the lovely letter we received on completion of the job. That’s our proud boast after the Graham Environmental Services team captured the prestigious Business Fives title at Glasgow’s Soccerworld. MD Ross Graham and the squad had already been crowned Tayside champions and after an impressive 15-game run the lads saw off Story Contracting 4-2 in a hard fought final. 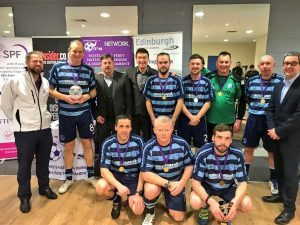 Nearly 80 businesses entered the competition organised by Business Fives and insider.co.uk, which has raised around £10,000 for charity. Tagged “The Rat Catchers,” the team’s fantastic efforts saw our nominated charities Cash for Kids and Downs Syndrome Scotland share the £1500 prize-money. Ross said: “It was a brilliant event and very well organised. We enjoy our fives and the lads were superb. They did us proud. “We were delighted to progress from the Tayside event backed by the Dundee and Angus Chamber to the Glasgow finals and it was great to come home with the trophy. Craig McFadden’s goal scoring performance was singled out by former Rangers and Brighton striker Gordon Smith for the man of the match award. Former East Fife centre Ross and our current Montrose and ex-St Johnstone midfielder Martyn Fotheringham, with a double, were also on target. The squad skippered by Ross featured fellow director Phil McKenna, Fotheringham, McFadden, Neil Mackay, Stewart Sheed, Phillip McLagan, Jamie Graham and Chic Campbell. Skipper Ross Graham (second left) received the trophy from former Old Firm stars Gordon Smith and Jim Melrose. EUROPEAN Tour professional Bradley Neil has welcomed grassroots support in his rookie season rubbing shoulders with the world’s best golfers. He was speaking at Blairgowrie Golf Club, where he was being presented with his own parking space in recognition of becoming the first Perth and Kinross player for nearly 40 years to secure a Tour card. Bradley’s bag carries the Graham Environmental Services logo this year and everyone in the team is keeping an eye on his progress. Bradley admits support on the home front has boosted his confidence, with group directors Ross and Stuart Graham and Phil McKenna long-time supporters. 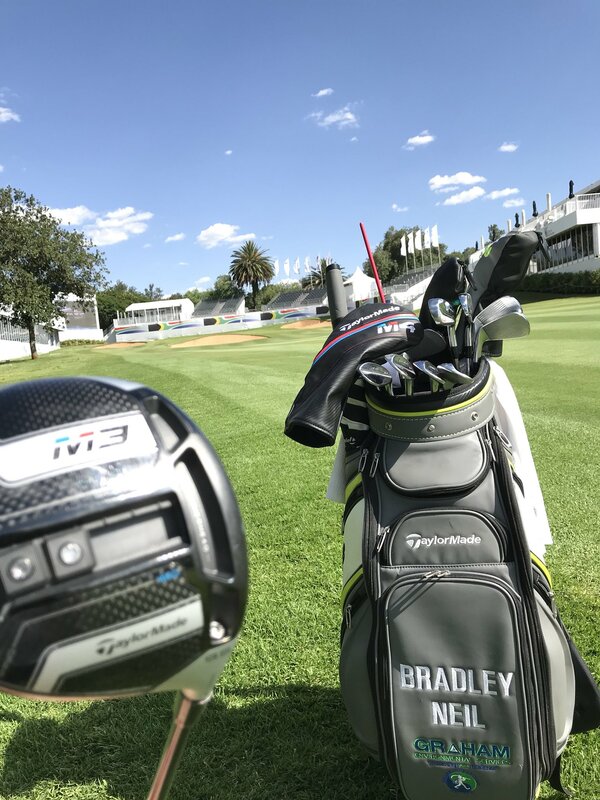 “I’ve had support from TaylorMade and Adidas since I was a youngster but it’s been great to have the backing of local businesses like Graham Environmental Services and Lamb and Gardiner,” said Bradley. “Blair isn’t a big place and it is special to have support from companies in and around the town. I’m in a relationship with people I trust and they know me well. They were there for me long before I turned pro. “Phil caddied for me at The Masters and Stuart has been a big part of my life ever since I started golfing at three years old. Ross has been a big support for a decade and more. WE had a ball – quite literally – celebrating the 25th anniversary of Graham Environmental Services! And thanks to our staff and many big-hearted clients and business contacts we hit our £25,000 target to mark the big year and boost three great charities, CHAS – which we have supported for many years – Scottish Huntington’s Association and Tayside Children with Cancer and Leukaemia. 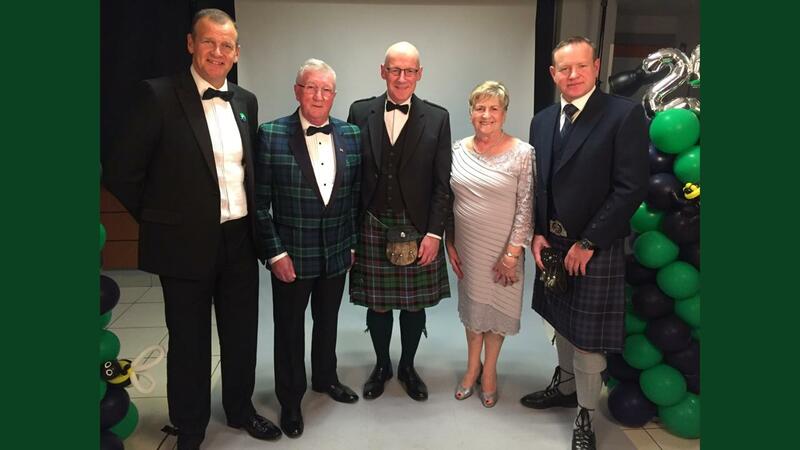 It was a special occasion for Jimmy and Anna, who founded the family business back in 1993, and company directors Ross, Stuart and Phil McKenna. Before dancing the night away to top band Fever, guests at the Perth Racecourse venue were surprised, and delighted, by an appearance by The Singing Waiters. Auctioneer Matthew McNaughton helped tease out bids totalling more than £6000, charity volunteers assisted with the Silent Auction and m/c Gordon Bannerman kept the night moving along. He said: “Graham Environmental is a credit to its founders, Anna and Jimmy, to its directors, its staff, Perthshire and to Scotland. “The company has been fuelled by the founders’ values of honesty, integrity and excellent customer service. “Those values have been taken forward by their sons and fellow directors, Ross and Stuart, and by all of the staff, creating one of Perthshire’s most dynamic companies. We wish him well for this week and the season ahead as his bag sports the Graham Environmental Services logo. For the golf enthusiasts out there he will have the new Taylor Made (Twist Face) M3 Driver in his bag which is currently only available to Taylor Made Staff players and was used by Dustin Johnson when he won the Tournament of Champions PGA Event in Hawaii last week.